Born in Zimbabwe, Maddy moved to the South of France aged 6 and grew up just outside of St Tropez. Living on the coast, Maddy automatically fell in love with the ocean. 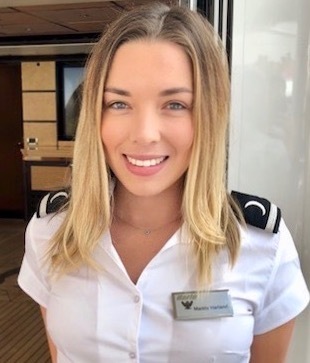 Maddy joined the yachting industry aged 18 and has had an amazing time since, working on some excellent boats. In her spare time, Maddy loves creative writing and is a self-proclaimed bookworm! Her other hobbies include yoga and tennis; she is also a keen diver and hopes to complete her PADI Open Water course soon. Maddy also has a love of travel and has visited South Africa, Cuba, Vancouver and all of the Bahamian Islands. Her work has also taken her to some stunning and exclusive locations such as Puerto Rico and the Dalmatian coast. As Harle’s newest addition to the interior team, Maddy is incredibly excited about the upcoming season and all the adventures it has to offer!